Thread: Answers to WTFWTK 2.32! Check out his answers to your Round 32 questions! Nope, no plans for this right now. 2. Spectror: In a recent Matty update, we read that “In addition to the 12 monthly figures, we are also going to offer 2 - 4 'bonus' figures each year, usually at the end of each quarter. These figures will be A-list hero and villain updates”… Would you give us an extensive list of who you consider A-list characters (both heroes and villains)? Thank you! What we call the “Quarterly” figures (as opposed to the “monthly” subscription figures) are actually back-up figures that we offer in case one of the subscription figures misses its scheduled release. This help guarantee there is at least one figure a month. These back-up figures are usually variants of characters who either have a variant in the vintage lines (i.e. Battle Armor He-Man), a significantly different look in the 2002 series (i.e. King Randor, Evil Lyn, etc.) or a way to refresh a character’s armor or colors based on fan demand. There is no set rule, and things may change around a bit but this is what we are looking into. Hope that helps! 3. masterenglish & bcrduke: Would you, or have you at all considered running another fan based character creation contest (like with Fearless Photog back in the 80s) that would be made into a MOTUC figure, and/or a "Fans' Choice" poll for MOTUC like the one that was done for DCUC where fans could pick some of the characters they will get next? This is an idea which has been kicked around internally but at the moment the answer is a “no.” However, it doesn’t mean we may not do this one day - it’s just off the table at this time. 4. ian_highful: Considering that the design of Adora's sword was so popular and the fact that it is suppose to be a clone of the sword of He, is there any chance of a larger version of her sword, without the stone, being released with Adam or a He-Man reissue? The sword shares the same cloned magical properties as the Sword of He, meaning it can also harmonize with the Orb of Power inside Castle Grayskull. It is not an identical “twin” though, so to speak. She-Ra’s sword also needed the Stone of Protection in order to maintain its magical powers so there are key differences in the swords. They are not meant to be the exact same look, physically, and never were. So, the direct answer is “no”. 5. radrcks & Darkspecter: For future PoP figures that have skirts/pants (ex. She-Ra), will they be designed so the girls can ride their horses and cats properly? Perhaps with slits up the sides of the skirt or a removeable skirt with an extra cloth one for seated poses? We are still tackling how this will work and will find a creative way to make sure She-Ra can ride her mount, if and, when we do a Swiftwind figure! Click here to ask questions in Round 34! And, have fun discussing Toy Guru's answers to your Round 32 questions! It's good to see that TG is taking more of a "not at this time" approach in his answers, instead of the stiff-necked, "no" that he was accustomed to giving us previously. Fans tend to have alot of great ideas, and as a collector's line, it's good to know that Mattel is flexible to our ideas. 200X Power Sword, 200X Toon, 200X Continuity.... Yeah, it's all about 200X!! In the Secret of the Sword it is stated several times that the sword of power and the sword of protection should be identical except for the jewel. I know it's a Filmation movie, but it's one of the key elements in the He-man/She-Ra continuity. I really like the answer on the bonus figures. I was really hoping they were not going to just do a ton of He-Man and Skeletor variants. Excellent news!! I love all the answers except for #1 and #4. I'm sure #1 will change in time. But #4...seriously?! They are not meant to be the exact same look, physically, and never were. So, the direct answer is “no”. The Power Tour was the same. "Filmation" swords, She-Ra's being gold with a jewel. The only swords that were different were TOY She-Ra's swords (1st gold one, recoloured lavendar, the pink one then the gold one that's the pink one recoloured). Question #4 is asking if we can get a bigger, non-jewelled version of Adora's sword for He-Man...a.k.a. the MINI-COMIC He-Man sword. Last edited by Darkspecter; March 3, 2010 at 12:52am. Pumped for a Swift Wind in this MOTUC line that isn't pink and ultra girly. Should be a little more acceptable for a bunch of 20s-30s year old dudes to purchase. He doesn't seem to have actually read all of question 2. I think he did, and the answer is "no, we don't have a definitive list of possible variants" (and it seems like the basis for them has changed again - now the rule is "any pre-existing alternate look, whether a vintage variant, 200X design, etc is possible as long as Mattel has the rights, they are different enough [in Mattel's opinion] from the existing MotUC look and there's enough demand). Yes, 200X Evil-Lyn and King Randor are mentioned again! I'll be defiantely skipping the first Evil-Lyn and I'll save my money for the 200X Version. Thanks TG! Not to single you out, but companies just have to be driven crazy by fans. Every time we get a "Maybe, but nothing to announce quite yet." answer people complain that they're being wishy-washy, and then when they do actually give a straight-forward "no" people complain that they're being too harsh. I think the answers were fair and mostly to the point this time around. I'm pleased about the bonus figure answer! I certainly have no complaints this time. I'm hoping for a Disco Skeletor for the next subscription exclusive! Fully flocked! "I don't like to feel good! I like to feel EVIL!" I think the answer as to why they won't make the 2002-inspired twin swords for Keldor makes sense on its own(it was an anime/updated look for the original twin swords; they want to go back to the look of the original swords). It only ceases to make sense when you consider they made the 2002-inspired power sword(it too was an anime/updated look for He-Man's original sword). I feel they should either have said no to both of them or yes to both of them. I am SO tired of the "pink & girly" comments... it is getting old. The color "pink" is only "girly" if you personally think it is... it's a COLOR... it isn't girly or not girly. It's the color RED with some white in it. I wanted all the POP stuff to look more like the vintage toys, but since we are getting the Style Guide designs (which makes no sense since the non-Filmation MOTU designs were used to make the MOTU characters so far), we probably won't get the toy Swiftwind. I also just LOVE how TG says "If and when we do a Swiftwind figure." First of all, he spells it: "Swiftwind, which is how it was recently Trademarked. I know that he isn't planned for this year, NOR the first half of next year... I suppose that's ok, since it took He-Man a little over a year to get HIS steed. I HATE what they are doing with the swords. WHY couldn't they use common sense and make He-Ro's "Sword of He" an energy blade, have it become the Orb of Power, and from that different swords are made: The Sword of Power, The Sword of Protection, etc. No... they have to reinvent the wheel. You know, because the Sword of Power and the Sword of Protection being twin swords was NEVER a good idea, and didn't work in the 80s, and didn't make fans feel like their favorite of the twins was equally important. Thank you for trying to make She-Ra less important, ya woman-haters lol. Again, OLD... just OLD and annoying. Last edited by bcrduke; March 3, 2010 at 06:13am. [B]The sword shares the same cloned magical properties as the Sword of He, meaning it can also harmonize with the Orb of Power inside Castle Grayskull. It is not an identical “twin” though, so to speak. She-Ra’s sword also needed the Stone of Protection in order to maintain its magical powers so there are key differences in the swords. They are not meant to be the exact same look, physically, and never were. I guess this is referring to the MOTUC canon, because in the Filmation cartoon, they were meant to have the exact same look and size, with the exception of the stone. no you're not. I just can't believe there are things like this that people complain about :P i mean it is preference i guess but really? wouldn't adora or she-ra look kinda out of place with a huge power sword? It would be even better if they sent out a small version of the he-man sword for he-man to match the size of adora's and she-ras to make the fans. It must just be a MOTUC canon thing they were referencing, because it's not like that at all in Filmation. I also think the answer about the swords might be something that ties into how the old classic toyline's swords for He-Man and She-Ra were radically different in size, shape, color, and scale. I think it's a neat way to sort of backpedal and "explain" the classic toy swords and march ahead with a new MOTUC storyline/explanation for the sword's different looks. It really doesn't bother me, because the Sword Of Protection looks RIGHT in Adora and She-Ra's hands... the only time I go "huh?" is if I take the sword and put it into the male figures' hands- only then does it seem too small. But, meant for She-Ra as it is, I think the smaller sword looks just right. As someone that loved and played with both MOTU and POP equally, I can kind of see where they're coming from with their style guide decisions. Most everyone here played with MOTU toys. So when they think about MOTU, it's probably an even mix of thinking about the toys and thinking about Filmation. On the flipside, most everyone here did not play with POP. Whether it be because their parents prevented them from doing so, or they just weren't interested in "dolls." Therefore, when THEY think of POP, they think of the Filmation version, as it was the source of greatest exposure. MOTUC is all about presenting the iconic versions of the characters. for MOTU, it's the old school toys. For POP, it's the cartoon. No, I'm sure you're not alone. I'd have a problem if She-Ra's sword didn't have the stone in it but I'm fine with the way it is. I'm just happy we're finally getting her. It's a toy horse no matter what. I don't care if it has "blood" coming out of its mouth, having it pink or having it a less "girly" color is not going to really change whatever opinions others have about people like us having a toy horse. I wouldn't take it to heart though. Unfortunately that's just how a lot of us are raised to see things. I remember I was at ToysRus when I was really little and my parents were buying me a backpack. I picked out one that was pinkish in color. My dad tried bribing me with some action figures if I chose another color. My mom eventually told him to let me get the color I wanted. Due in part to my mom's letting me get the pinkish backpack, I now wear frilly dresses in public(I keed, I keed ). Like you said, pink is just a color, but a lot of people are raised, unfortunately, to think it automatically makes you weak if you're a guy who likes it. It'll eventually change if enough kids get beat up at school by guys wearing pink shirts. I can handle She-Ra's sword the way it was shown at Toy Fair, but I wish Mattel would finally pony up the cash and buy the rights to Filmation. I rarely have positive things to say about Hasbro in the way they deal with their properties, but at least they bought up the rights to the Sunbow cartoons. C'mon Mattel, let's get with it. This is true. Except for a few designs here & there, Filmation kept their MOTU cartoon looking like the toys. They really deviated with POP. Since I feel a lot of us watched She-Ra more than bought her toys(although I did have She-Ra), making the MOTUC interpretations look like the style guides(until they finally get the rights to Filmation) is probably the safest route. That's all up to personal opinion, really. I'm a HUGE fan of the cartoon. It had excellent stories and everything, but I did not like the character designs for 90% of the characters. Instead of the bright colours of the toys, they made the colours MUCH duller and subdued and "dumbed down" some character designs. Peekablue is a great example. The Filmation/Styleguide She-Ra design is my favourite (I still love the toys though), but I will be MASSIVELY disappointed if the ladies are 100% out of the Styleguide. I was a kid who loved the PoP cartoon and figure. The cardback designs and figures are my favourites. I want Mattel to do a combination of them, much like collectors are getting for the MOTU men in MOTUC. It will be completely unfair if they completely ignore the 80's figures, mini-comics and cardback art and ONLY use the designs from one document (which is pretty much the case so far). Last edited by Darkspecter; March 3, 2010 at 10:05am. Is this the essence of the elders that resided in the crystal chamber in the 200x series? Dang! Queen Angella looks totally different in her toy form. As someone who had a crush on her Filmation version as a little kid(I guess I liked the mature ladies back then ), I really like her with long hair. Bummer about He-Man and She-Ra carrying fraternal twin swords. I've always understood that their swords were identical, apart from the jewel. 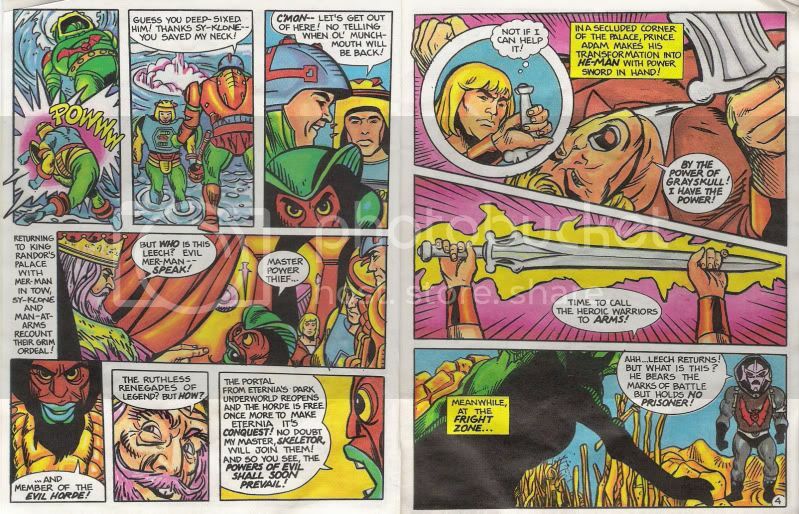 When we received a different sword design with Adora, I had hoped that the new MOTUC bios would explain that the sword actually changes shape/design when Adam and Adora change into their super-hero personas (to help hide their secret identities and such) so that Adam and Adora would have identical swords and He-Man and She-Ra would have identical swords. Wow that's exactly how I feel. I like POP but I hated the original toys. I always wanted them to look more like the cartoon. When I was like 7 or 8 I had a She-Ra figure and I hated the way she looked, because she didn't look like the cartoon. So since they have already started making Adora/She-Ra look like their Filmation versions, I would prefer it if Swift Wind had his Filmation look as well.